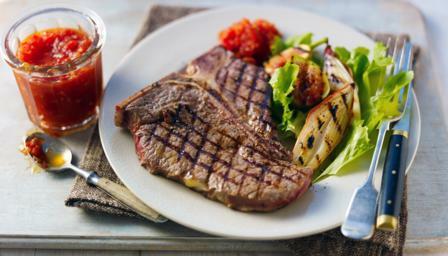 Chargrilled steak – who can resist? Served here with sweet and sharp tomato chutney and chargrilled figs. For the chutney, place the vinegar and sugar in a large saucepan and bring to the boil then cook for 3-4 minutes until the sugar has melted. Add all the other ingredients, bring to the boil and cook for about 20-30 minutes, stirring frequently. If the tomatoes are very juicy, you might need to cook for a little longer until the mixture starts to thicken. Leave the chutney with a chunky texture and don’t cook too long so that the ingredients start to break down into a purée. Cool the chutney before serving with the steak, and place into sterilised jars to store for two to three weeks in the fridge, the flavour will improve over time. For the steak, heat a griddle pan until searing hot. Rub the steaks with a little olive oil then season with salt and black pepper. Place onto the griddle and sear for two minutes then turn the steaks 90 degrees and sear the same side for a further two minutes. Turn the steaks over and repeat, searing and turning. Remove the steaks from the griddle and set them aside, to rest, on a plate. Meanwhile, rub the shallots with the rest of the olive oil and place cut side down onto the griddle and cook for 3-4 minutes. Then add the figs, face down, and cook for another minute until they are all tender and charred. Whisk the balsamic vinegar, lemon juice and extra virgin olive oil together then season with salt and freshly ground black pepper. At the very last minute, toss the lettuce, shallots and figs together in a bowl with the dressing. To serve, for each person, place a steak onto a board, pile the salad alongside with a spoonful of chutney.